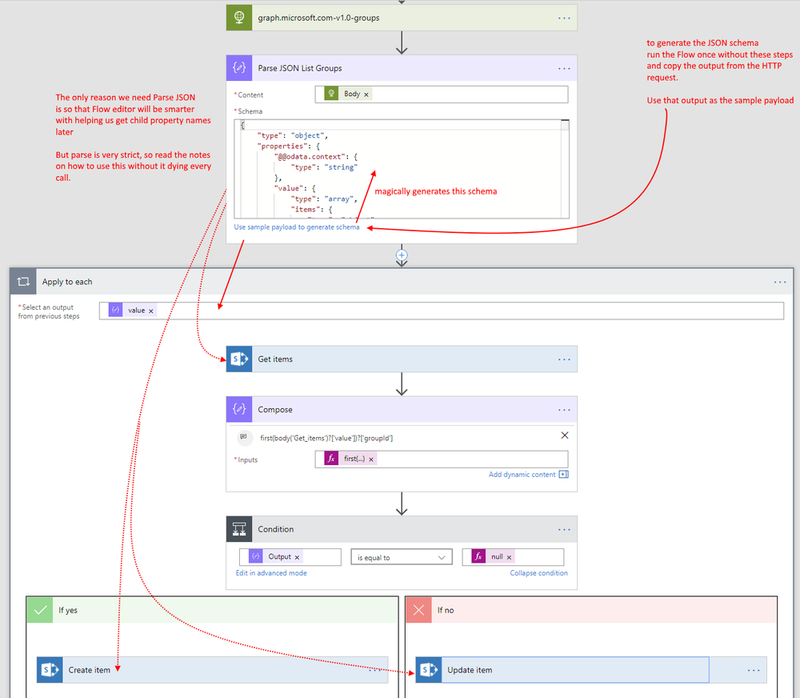 This is the second post on building a group management tool with Flow and MSGraph. In this post we talk about how to get a list of all your groups and copy them to a list in SharePoint so you can do more fancy things with them. Some of you may have seem my love letter tweet. This picture is complex, because it has a lot of tricky parts that's mostly caused by the way Flow's Editor works. Flow's editor will try to filter the variables available to you by type, the Parse JSON action will parse JSON into a strongly type object following a strict schema. This lets your subsequent actions work well. BUT when your action returns null then suddenly the Parse JSON action can fail. 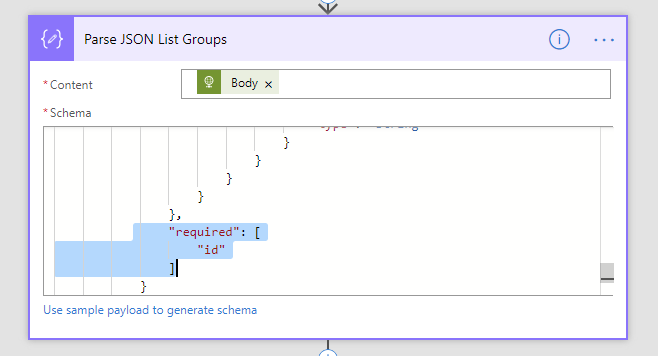 You'll then need to go back to the schema, and change some of the error "types" to "any". You also may need to remove some of the fields from "required"
These tweaks are necessary because Parse JSON will fail if one of your groups don't have a createDateTime, classification or displayName. You need to run this on your environment and check whether the fields need to be required or tweaked. 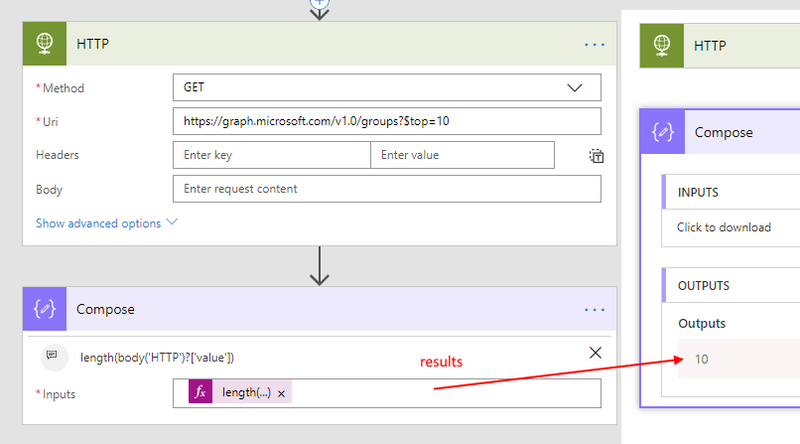 Because MS Graph supports Delta Queries - we can call the Graph with a Delta Query link, essentially, each time we call it, it'll return a nextLink (or a deltaLink). So we just remember that, and use it the next time we want to call MS Graph again, and it will tell us just the differences. See the delta query picked up one new Group I created for testing. 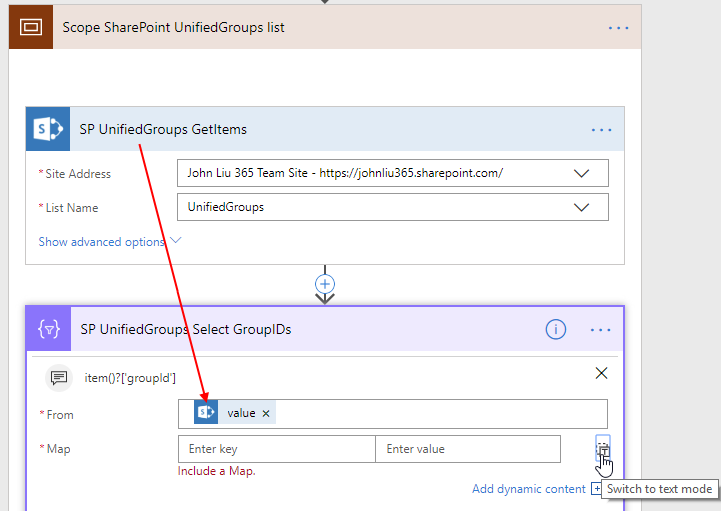 With a delta query - you can reliably set the Flow to run several times a day, and it will only send new/updated Groups back into the SharePoint list. Sometimes you want more information on that group. 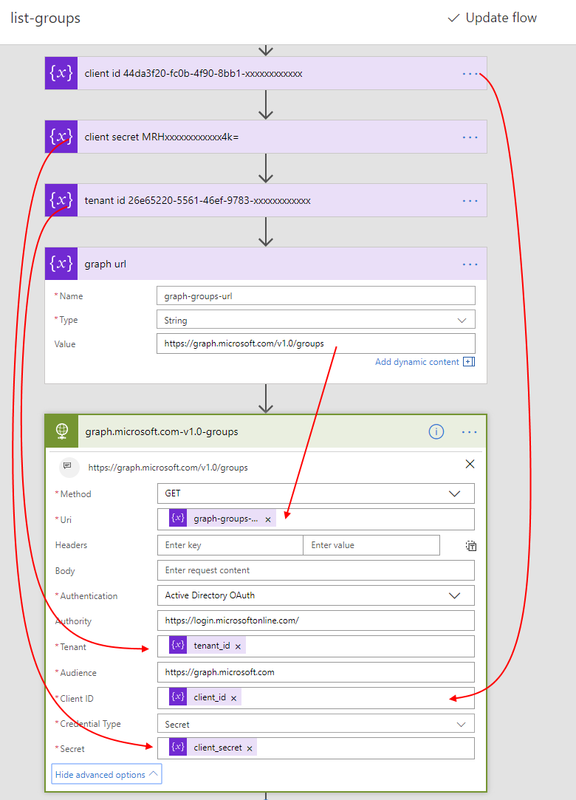 You can call Get group (on Azure AD connector) to get more information on the group. We can configure the foreach action in Flow to run in parallel with 20 concurrency. You'll need to add this to the definition JSON. 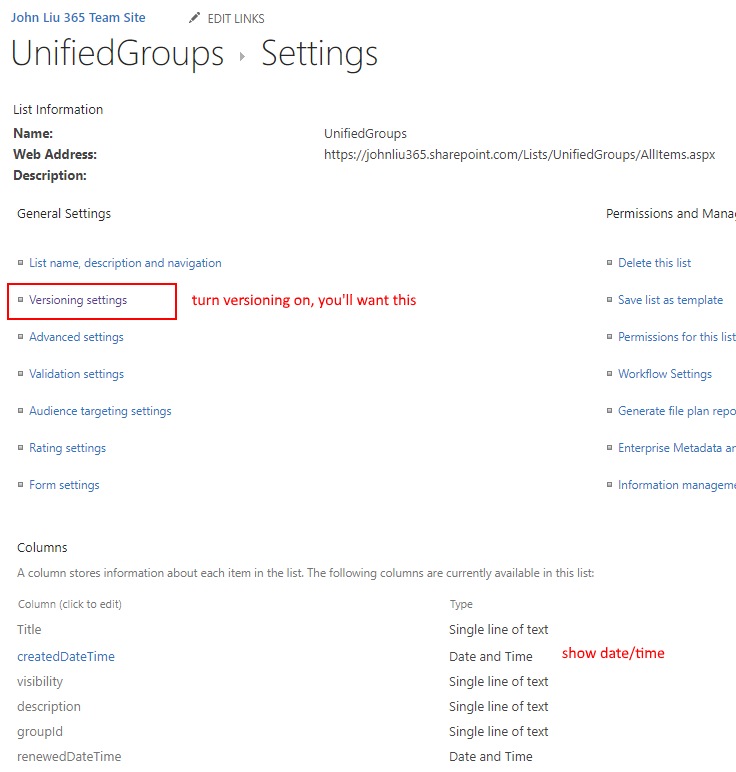 See the task of writing 19 Office 365 groups to sharepoint list was done in 4 seconds. 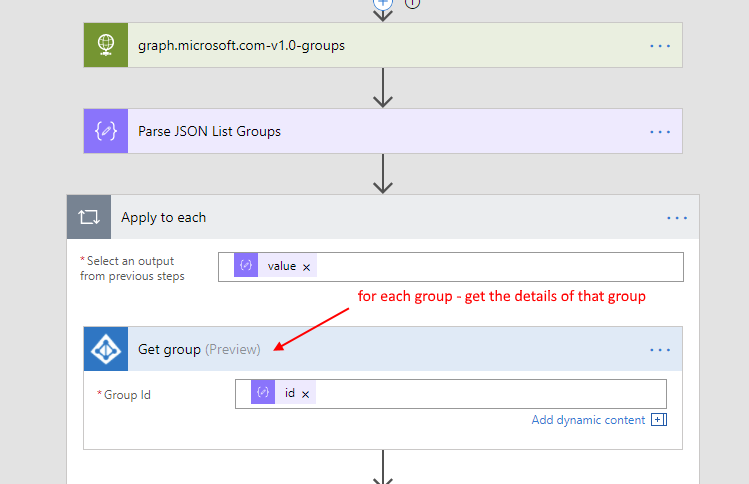 This section is added as @mikaelsvenson pointed out that I wasn't handling paging for groups. Mikael also told me to use $top so I don't have to create a few hundred groups for testing. But I don't want to do loops - I've seen a pagination control, I want to know what that does. Go to the settings for HTTP action and the first one is Pagination. Turn that on, and set the limit to 5000. Pagination controls seems to merge the results of multiple requests into one value array. This is good. Pagination controls works on Delta query - this is also good. Pagination results does not return the deltaLink for next Delta query. This is not so good. So if we are planning to merge both Pagination and Delta Query we'll need to may be make two calls. 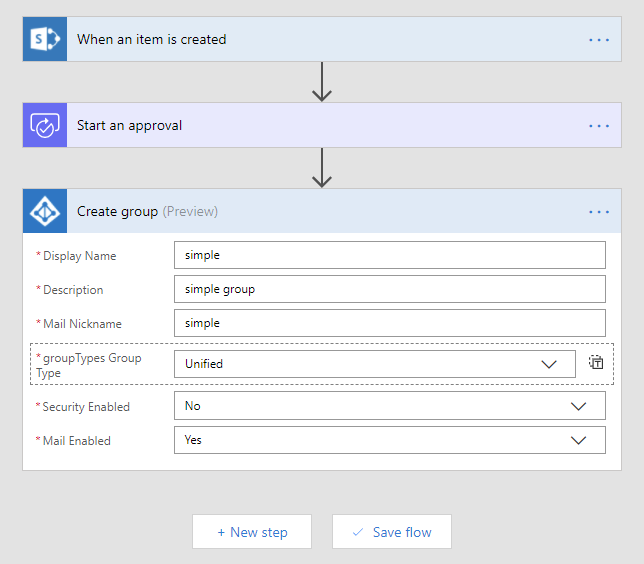 Because Office 365 Groups is a key component of group membership in Office 365, there will always be an evolving story on how to manage it, extend it, report on it and automate it. Microsoft will continue to add more complex features to Azure AD Premium. And this will be an enterprise grade solution to many customers that wants these features. But there is a lot of room for partners to build Groups Management solutions. Ultimately, we have realized this: Our client's organization has unique rules, and there's a need to customize, fortunately, we have all the tools at our disposal, and they are not hard to do. This is a post in a series about Office 365 Groups management life cycle. 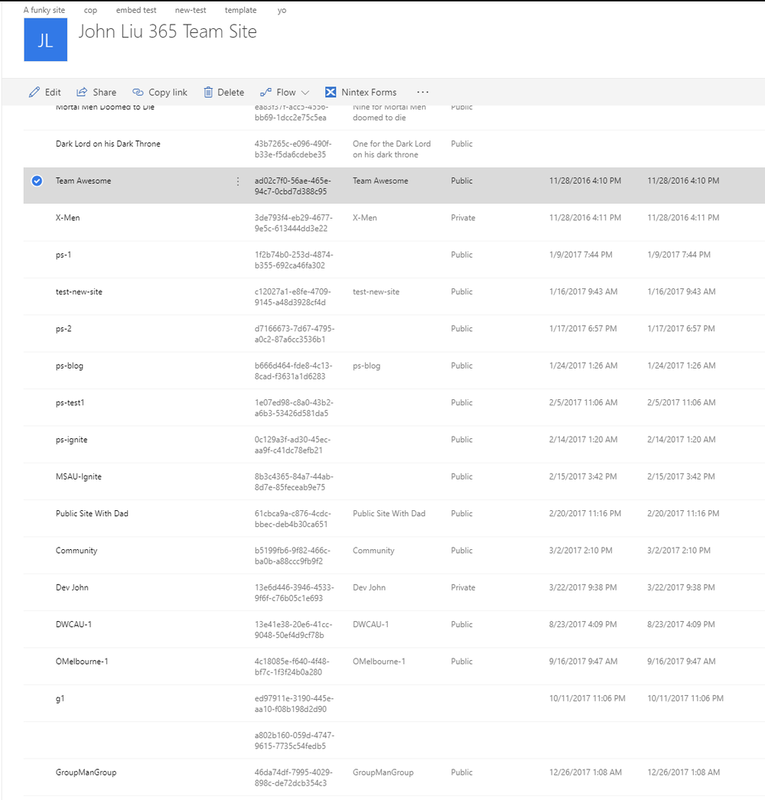 This is the first post - we will discuss the history Office 365 Groups creation. 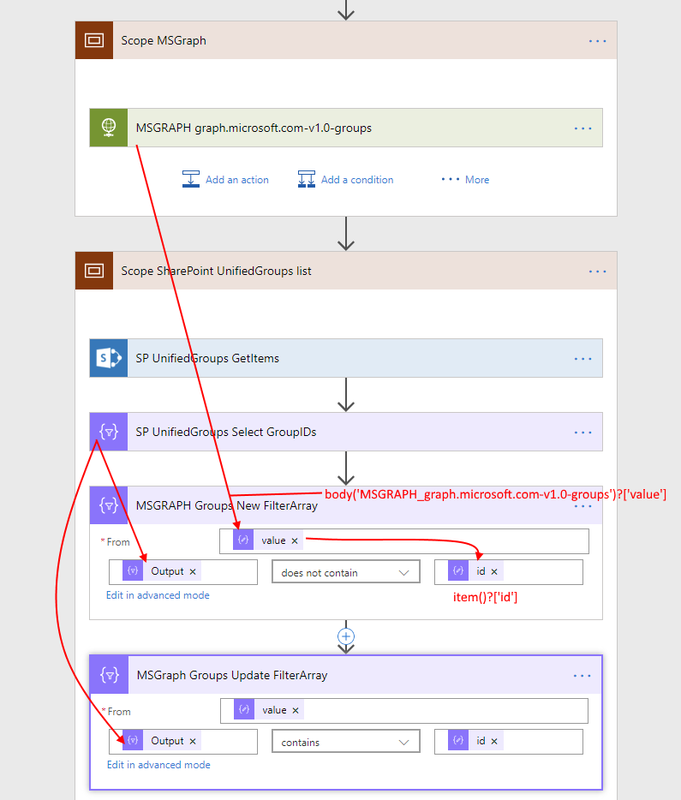 There have been many blog posts about how we can automate Groups creation. So this discussion is about understanding the underlying pieces, and how we must see these pieces as the building blocks to solve all your future problems. We must see this pattern. Everything we want to build is in one of these stages. When we understand these pieces - there's nothing we can't build, for practically free. The question isn't "No, this is too hard" or even "This should be free or out of box". The question we should all be asking is "Where do I find a piece that fits here, right now" because I have a crazy customization need. In 2017, everything got abstracted and simplified. This trend will continue into the future - there will be more Flow Connectors. Azure Functions will get more upgrades - durable functions are absolutely amazing. MS Graph will get more API endpoints. Life will be even more amazing. There are a lot of solutions to solve. 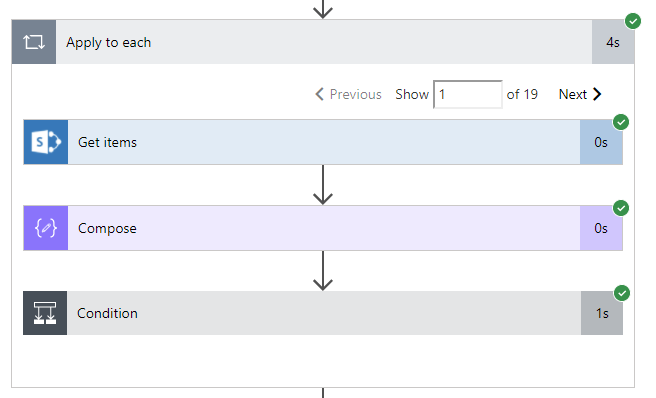 I want to cover more of Office 365 Groups life cycle management, with Flow and Functions, all on top of what MS Graph gives us already. If you are interested in this topic or have shared some of the ideas you are working on - please share them with me and I would be happy to link to your work.